A successful and pleasant business trip or vacation depends on adequate preparation. Learn how to organize your air travel, hotel reservations, car rentals, visas, passports, and immunizations. Traveling broadens our perspective of the world in which we live. Going to foreign countries provides exposure to different cultures, different food, and different languages. Many countries encourage international tourism as a way of boosting their local or national economies, but there are some countries and cultures which view foreigners with suspicion and do not particularly care for strangers in their land. 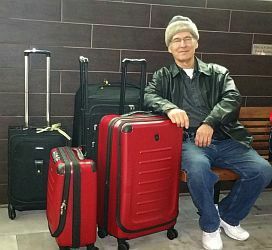 Even in some popular "civilized" travel destinations it is easy to become a victim of thiefs and criminals who will take your luggage, assault you to steal your jewelry and valuables, or cheat you in the price of taxi fares or other services. Your best protection is to be alert, book your tours through trustworthy agencies, and never travel alone to an unfamiliar destination. Make sure that you know the traditions of the land where you want to travel before you start your trip. What mode of transportation will you use? The preparation for your trip will depend on whether you travel in your own car, in a bus, train, airplane or cruise ship. When you travel in your own vehicle, you are responsible for knowing how to get to your destination and for planning for breakdowns and emergencies on the road. Public transportation frees you from these tasks, but imposes time schedules and load restrictions. Air travel requires you to carry light luggage, whereas land transportation and ships do not have such strict weight requirements. Learn about carry-on luggage. Scheduling your trip involves careful planning. Travel agents can help you to organize some of your preparations. First of all, take care of your travel documents. Some countries require only passports, but others require passports and visas. Do not wait until the last minute to obtain your passport because this may require several weeks. To get the best deals for your transportation and hotel accommodations, you will need to make your reservations well in advance of your travel. The best bargains can be obtained during the off-season when demand has diminished. Airlines that provide food service can accommodate special dietary requirements if you give them at least 24 hours advance notice. When traveling to a foreign destination, make sure that you have a visa, if required. The strict rules for air travel do not allow you to board an airplane if you do not have a visa for the final destination. Along with your passports and visas, you may need to take along vaccination certificates, and prescriptions for any special medicines that you need. Before embarking on a trip, check to make sure that you are allowed to travel with your medicines. Some medicines sold over the counter in the United States may be considered illegal in other countries and vice versa. There is nothing more unpleasant than starting a vacation on the wrong foot by having to explain to the customs authorities why you are carrying so many "drugs". As a result of terrorist activities, airports have increased their security inspections before allowing passengers to board. Get to the airport with plenty of time to manage the check-in congestion. Also, don't exceed the container size limits of carry-on liquids, gels, and aerosols, otherwise, your toiletries will be confiscated. All liquids, gels and aerosols must be in three-ounce (84 milliliters) or smaller containers, and they must be placed in a single, quart-size, zip-top, clear plastic bag. The locks for your luggage must be approved by the Travel Security Administration (TSA) so that your luggage can be opened for inspection without having to cut your locks. There are some items that you cannot bring back to the United States from an international trip. You cannot import items that could introduce diseases, invasive species, or that are prohibited under wildlife trade regulations. Any fruits and non-sterile foods, such as dried sausages, are usually confiscated by customs. If you visit a farm or ranch outside of the U.S., you will be routed to an area for agricultural issues where you will need to wash your shoes with special soaps. Items made of alligator skin, tortoise shells, conch shells, red coral, or even large tins of caviar may be confiscated as a way of protecting endangered species. Choose your souvenirs wisely! It is always a good idea to prepare an itinerary for a trip. The itinerary should have a list of your planned day-by-day activities, including the name, address and telephone number of the hotel or place where you plan to sleep. If you are driving, the itinerary should include the addresses and GPS coordinates of the places that you are going to visit. Pre-program your GPS and verify that the place on the GPS map corresponds to your intended destination. Try to schedule your travel during the daytime to avoid the hazards of driving at night, such as deer crossing the road. It is important to do your planning before you depart. Once you are on the road, it will be more difficult to get the information that you need. BE AWARE that if you have a flight in the early hours of the morning, like 12:05 AM, you have to be at the airport THE NIGHT BEFORE. finding out that nobody is at home. The following checklist can help you to prepare for your trip. Stop the newspaper and mail. A pile of newspapers or a stuffed mailbox tells thieves that you are not at home. You may come back from your trip to an empty apartment or house. Turn off computers, modems and other electrical equipment that does not need to be on. Just before stepping out of your door, make sure that all faucets are turned off, and that the water in toilets that you flushed has stopped running. Check the refrigerator and discard or give away foods that will spoil if you are gone for several days. Arrange for someone to water your plants and take care of your pets. Don't forget to leave the keys and itinerary. Do not pack your travel documents or money in a suitcase that may get lost. Take your important documents and money in a wallet or purse that you can access at all times. Make sure that your luggage has a tag with your name, address, and telephone number. Tie a colorful ribbon or attach distinctive stickers to your luggage so that you can identify it easily, and other travelers will not take it by mistake at a busy terminal. luggage if you are flying. Avoid fees and hassles at the airport. Note: Scissors or any sharp tools in carry-on luggage may be confiscated. A printed list of emergency phone numbers or address book may be handy if your cell phone batteries die or you lose the phone. For international travel, you may need to take a travel power adapter . European electrical outlets provide 220 volt 50 cycle electrical power. You will need a Plug Adapter to connect an American two-pronged plug into a European socket. WARNING: You may also need a Power Converter or transformer to convert the European 220 volts power supply to 110 volts required by most American appliances. An appliance can be ruined or cause a fire hazard if it is plugged into a power source that it cannot handle. Clocks that rely on the frequency of the alternating current cycles can gain or lose time when plugged into foreign power sources. Some devices, such as hair dryers, have voltage regulators that need to be switched to select the proper voltage. Always verify the voltage setting before plugging in the device. Check the weather forecast. Avoid side roads when there is snow or bad weather. This is important on a long trip when the sun may be shining on your arms and face for a long time. Take water for drinking, for the radiator, or windshield washer. Soft drinks may be OK for you, but they cannot be used for the car. You may be stuck in traffic for a long time when you least expect it. Children get bored easily and have very little patience for travel. Planning a vacation to a holiday destination that is suitable for your children is easy. There are thousands of great holiday destinations suitable for children, from things like Walt Disney World, to camping, to beach holidays. The real difficulty is the journey. Make sure your children are wearing loose fitting comfortable clothes, have plenty of snacks and drinks, and lots of things to keep them entertained. Traditional car journey games such as I-spy are still surprisingly great and have longevity, whereas modern technology allows the whole family to watch movies online. Sleeping bag, air mattress, air pillow and a patchkit to repair them. A roll of duct tape. Duct tape is handy for many repair jobs. Make sure that you have proper permits for guns and licenses for fishing and hunting. You may need a tape measure and a spring scale to make sure that your catches are of legal size. Use guns safely and wear a bright orange hunting vest! When traveling, stay aware of your surroundings to avoid being a victim of pickpockets. Do not travel with more than two credit cards, and notify your bank or the card companies that you will be traveling so that they will not put a hold on the cards when they start seeing charges from unfamiliar places. If you don't have access to a hotel safe, use a money belt or neck wallet under your shirt to hold your passport, travel tickets, and extra cash. Only carry in your wallet what you will be using for the day. If you run out of money in your wallet, go into a bathroom, and lock the door to retrieve extra money from your money belt. In crowded places, it is better to carry your wallet in a front pant pocket rather than in a back pocket that can be picked more easily. Sometimes thieves work in teams. One of them distracts you or pushes you, while another one picks your pocket. When I was traveling in Spain, a woman asking for charity pushed a baby against my torso while with her other hand she was trying to unzip the belt pouch that I was wearing around my stomach.